The Toy Run is South Africa’s largest motorcycle ride, and it’s all for charity. Every year at the end of November, tens of thousands of bikes rally together for give joy to the needy children of South Africa. Thousands of toys are strapped to bikes and paraded through the major capital cities. Please support Toy Run Cape Town on 18th November 2018. Whether you donate toys & gifts or funds, you immediately change the lives of children in need in homes, orphanages, places of safety and hospitals around the Western Cape – YOU can make the difference! 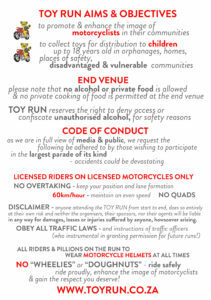 The Toy Run Cape Town needs more toys to be donated – LOTS more. Any excess funds will be used to purchase additional toys and gifts for the many hundreds of homes, orphanages, places of safety, hospitals, organisations and disadvantaged communities that rely on the Toy Run to provide toys and gifts for the children in need. Members of the public are welcome to attend the main Toy Run event to see the motorcycles (or on yours if you have one) and to be part of one of the largest charity events in the country. The motorcycle run itself is FREE – starting from Grand Parade in the City and GrandWest in the North, and ending at Killarney International Raceway Potsdam Road Table View. PLEASE DO NOT JOIN THE RUN ALONG THE WAY – Please only participate by starting at one of the two official start venues. You can pre-register to participate on the FREE ride HERE. You can enter Killarney and make your donation of toys and gifts for FREE. NO unlicensed riders or vehicles are permitted. (NO children under 16 permitted to ride a bike) Pillions need not be licensed to rider a motorcycle but all normal road rules apply. Please wear a motorcycle helmet and ensure your bike is roadworthy and safe. We are proud of our looooong good safety record and the Toy Run organisers have donated 1000’s of hours of our time for free, to sit down with the City and Traffic officials, we have planned and coordinated the event with the relevant authorities, to as far as possible keep you and your family safe during the event. Please help us keep this excellent record! That said, anyone attending the event does so entirely at their own risk and by participating indemnifies the organisers, their agents and representatives of any liability, howsoever arising. No toys are RESOLD by the Toy Run – these are all GIVEN away. All toys are distributed in the year that they are collected (ie none are stored). None of the Organisers, nor any of the volunteers are paid for their efforts.